Looking for a simple yet unique mug for your kids? You're in for a surprise! Mugs are both an essential addition to your kitchen and the perfect gift for just about anybody. They're the perfect way to enjoy your morning cup of coffee or a cozy hot chocolate when you're relaxing at the end of a long, tiring day. Who doesn't love curling up with a warm cup every now and then? Everybody needs at least one mug! Luckily, you can find thousands of mugs out there with all kinds of designs to choose from! They're a simple and fun way to express your personality, make a statement, or display proudly for everyone to see. Sometimes it can be hard to find a mug that really stands out as different from the rest-it's a pretty straightforward item. Besides its design, how else can a mug be unique? Surprise your kids with our one-of-a-kind Giraffe Cup! This mug looks just like any other animal mug, but with a twist. At the bottom is a cute baby giraffe that can only be seen once you've finished your drink! It's a new and fun way to serve your hot and cold beverages, and maybe you can even use it to encourage your kids to finish their milk every morning! Our mugs are all made with no harmful ingredients for your children and are dishwasher-safe, making them extremely easy to clean! ✅ 100% money back guarantee! Enjoy your beverages with a little surprise at the end! 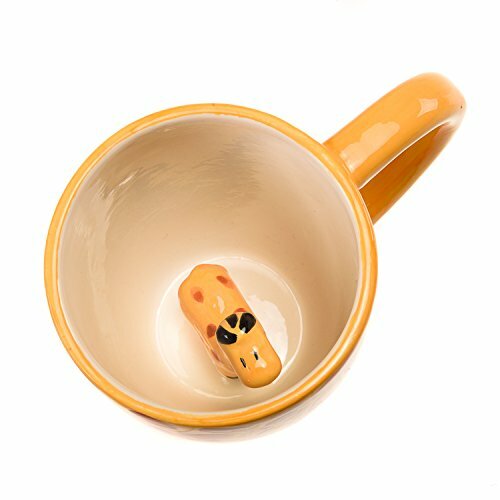 Get your Goodscious Ceramic Surprise Giraffe Mug by clicking on "Add to Cart" NOW! ☕️ A MUG WITH A SURPRISE - Where's the giraffe? You and your children will love the funny, baby giraffe surprise that awaits at the bottom of your mug after you've finished your warm cup of hot chocolate! ☕️ EASY TO CLEAN UP - Cleaning up after you've had breakfast or a late-night cup will be a breeze because our mugs are totally dishwasher-safe! Save yourself the time so you can spend more time with the kids! ☕️ COLLECT THEM ALL - If you love animals, we have surprise dog and cat mugs that you can collect too! Our cups are also lovely decorations for the kitchen or your kids' room! Click on "Add to Cart"! ☕️ AN ADORABLE GIFT - Give the perfect present for your loved ones this Valentine's Day, Christmas, Mother's Day, or Father's Day! Mom, dad, and the kids will definitely have fun sipping from our handcrafted cups. ☕️ 100% MONEY BACK GUARANTEE - We promise quality and satisfaction in all our products. If you run into any problems, let us know and we'll give you a full refund!